Categorized as: Stories on September 11, 2011. Hailed as a human-made famine, the severe drought in Somalia combined with terrorist blockage of aid, has 12 million East Africans starving this summer. Malkhadir Muhumed writes for AP on parents making heartbreaking choices no family should ever have to face. 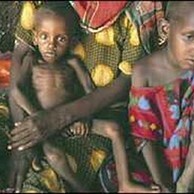 A tortured choice in famine: Which child lives? DADAAB, Kenya — Wardo Mohamud Yusuf walked for two weeks with her 1-year-old daughter on her back and her 4-year-old son at her side to flee Somalia’s drought and famine. When the boy collapsed near the end of the journey, she poured some of the little water she had on his head to cool him, but he was unconscious and could not drink. She asked other families traveling with them for help, but none stopped, fearful for their own survival. If you have ever loved a child, you might feel like you cannot even face the pain of what’s happening in Somalia and refugee camps in Eastern Kenya. The Skees family have struggled with unemployment and financial hardship, illness and anxiety; but we cannot fathom the pain of having to leave a child on the roadside in order to walk hours in the burning sun to rescue another. Yet we believe in the collective power of caring: If we band together we can make a difference. For complete coverage and information on how you can personally make a difference through the “Be the Change: Save a Life” initiative, go to SaveOne.net. “Be the Change: Save a Life” is supported in part by the Bill & Melinda Gates Foundation. In honor of the children in our family, we are sending a $1,000 grant today to Save the Children to reach at least a few families; and we will continue our work to advance education, microenterprise, health, infrastructure, and peace until the ecosystems in our neighborhoods—locally and globally—cultivate thriving opportunity for all.